Tired of messing around with neck bushings? Is there a simpler (and potentially better) solution for controlling case neck tension? Yes there is — the precision honed non-bushing die. You can purchase a Forster non-bushing Full-length sizing die for many popular cartridge types for under $50.00. Then you can send that die to Forster, and Forster will custom-hone the neck for a nominal $12 fee plus return shipping*. When done right, the honed FL die can load ultra-straight ammo with the precise next tension you prefer for your brass and bullet choice. Conventional, non-bushing full-length sizing dies can create ultra-accurate ammo with very low run-out. For some applications, we prefer a non-bushing FL die over a bushing die — so long as the neck tension is correct. But many FL dies have an undersized neck diameter so you end up with excess neck tension, and you work the brass excessively. Forster offers a simple, inexpensive solution — honing the neck diameter to whatever size you want*. If you purchase a Forster non-bushing, full-length sizing die, Forster will hone the neck dimension to your specs for $12.00 extra (plus shipping). This way you can have a FL die that provides the right amount of tension for your particular load. (The max amount of diameter change Forster can do is about .008″) Forster dies are relatively inexpensive so you can afford to have a couple of FL dies with necks honed to different diameters — such as 0.266″ and 0.267″ for a no-turn 6mmBR. The die itself is fairly inexpensive — currently Precision Reloading charges $41.49 for a Forster 6mmBR FL sizing die (Forster Part #018121). Steve Rasmussen of IowaHighPower.com gave this a try. In fact, he had three dies made — each with a different neck dimension. Here’s his report: “My original Forster 6BR FL die sized the necks down a lot [to about 0.260″]. I sent my die in and asked if they could supply two more FL dies (for three total) to have the necks honed to 0.265″, 0.266″, and 0.267″.” In addition to the purchase cost of two more FL-sizing dies, Steve paid $36 ($12 per die) for the three dies to be honed. We custom hone the inside neck diameter by using a diamond stoning process. We enlarge the inside diameter to your specification to prevent over-sizing of the case neck due to thick neck walls. You may require this service for multiple reasons: 1) If you use some brands of brass cases which have thicker neck walls. 2) If you do not intend to outside neck turn case necks that have thickened after repeated firings. Please specify desired inside neck diameter. Note: 1) No more than .008″ stock removal from your existing die neck diameter is possible. 2) Honing is done in increments of one half thousandth of an inch (.0005″), meaning that your specified inside diameter must be either.XXX0″ or .XXX5″. FEES: $12.00 plus actual return shipping cost & insurance Please allow 1-3 weeks. Share the post "The Honed-Neck FL Sizing Die Option — Alternative to Bushings"
Many novice hand-loaders believe that neck bushing Inside Diameter (ID) size is the only important factor in neck tension. 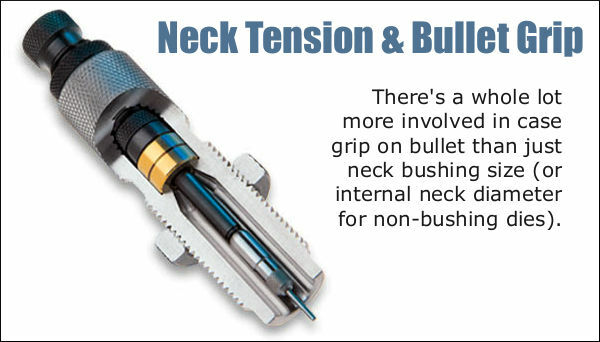 In fact, many different things will influence the grip on your bullet and its ability to release from the case neck. To learn the ins and outs of neck tension, take some time and read this article carefully. While we certainly have considerable control over neck tension by using tighter or looser bushings (with smaller or bigger Inside Diameters), bushing size is only one factor at work. It’s important to understand the multiple factors that can increase or decrease the resistance to bullet release. Think in terms of overall brass-on-bullet “grip” instead of just bushing size (or the internal neck diameter in non-bushing FL dies). Share the post "Controlling Grip on Bullet — Why Bushing Size is Only One Factor"
Here’s a handy new item, particularly if you load large quantities of bulk ammo for a variety of firearms. Lyman’s new Ammo Checkers check the diameters of reloaded rounds and factory ammo, so you can quickly confirm that your ammo fits a standard chamber. Just drop your loaded rounds in the Ammo Checker, and if the round fits into the gauge, it will fit in the gun’s chamber. Why Use a Case Gauge? We find that case gauges like the Lyman Ammo Checker are particularly useful for handgun reloaders using progressive presses. The chambers of many popular semi-auto pistols are partly unsupported. This allows the case to swell in the bottom quarter. 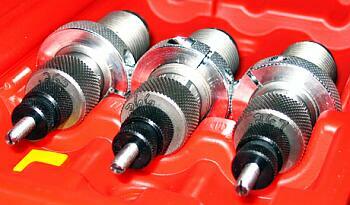 The case may not be sized adequately by your sizing die, which can lead to misfeeds or malfunctions. 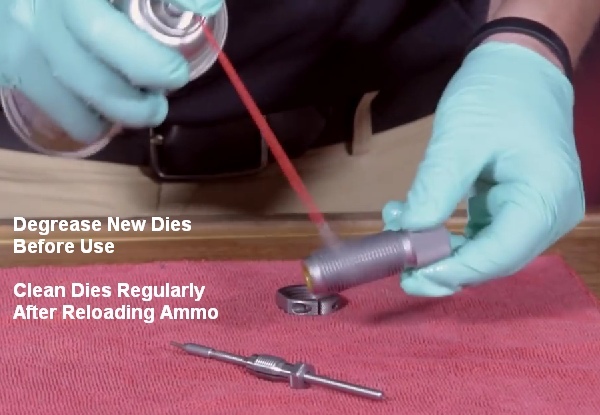 Additionally, if you have loaded a large quantity of ammo for a semi-auto rifle such as an AR15, it’s not a bad idea to check your cartridges before you load them into your magazines. All you need is one mis-sized round to cause a stoppage. That will ruin your day if you are competing in a Service Rifle match or 3-Gun event. Share the post "NEW Lyman Ammo Checker Multi-Caliber Case Gauges"